Just a reminder that even though we all love our hours, minutes, seconds, months, weeks and centuries, none of them are real. One year is real, but it does not necessarily start on January 1st. It’s just one whole orbit around the sun. One day is real, but it does not necessarily start at midnight. It’s just one revolution of the planet. Everything else is imagined, no matter how much time we spend measuring with our watches and calendars. 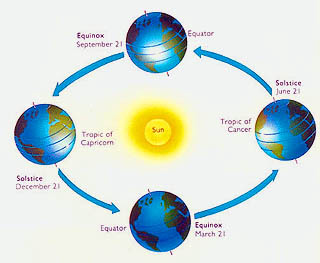 So celebrate new year, but remember you could just as well do it on any other date, most appropriately on March 21st or September 21st at an equinox. A good lesson you just taught me. Myself and many people I know, have always said “its just another day”. Thanks, and a happy new day to you.. and all. What do you mean by ‘real’ ? A year and a day are measurements of real events, i.e. one orbit of the sun by the earth, or one rotation of the earth. All the other divisions of time are man-made and have changed over the course of history. Men decided in Roman times to divide a year into twelve months of various lengths, and in different historical periods to count seven days as a week, and to divide a day into 24 and an hour into 60 etc. These could easily have been different divisions and subdivisions and may not have become standardized by gradual globalization had history unfolded differently. So only the year and the day are related to real events, and the year can start on different days in different cultures.